If you have pets, you know that with all the love and affection also come plenty of odors. Fortunately with cats, you have a choice with their kitty litter. 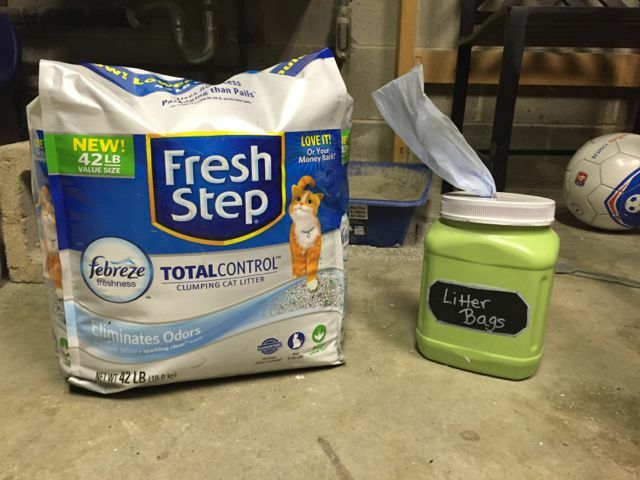 We are not talking about just any litter, but the new Fresh Step Total Control with Power of Febreze. But the power of Febreze not only deodorizes your litter box but also has many uses in the house including deodorizing your fridge, closet and even old shoes. Something I have never heard or thought about. Our cat Lacy uses both the indoor litter box as well as the outdoors, but either way, I need the kids to help clean out the litter box. If I don’t have bags nearby, they refuse to clean out the box and it will build up. Not to mention, the smell is horrible! I decided to fix this and no longer give the kids an excuse to ignore this chore. 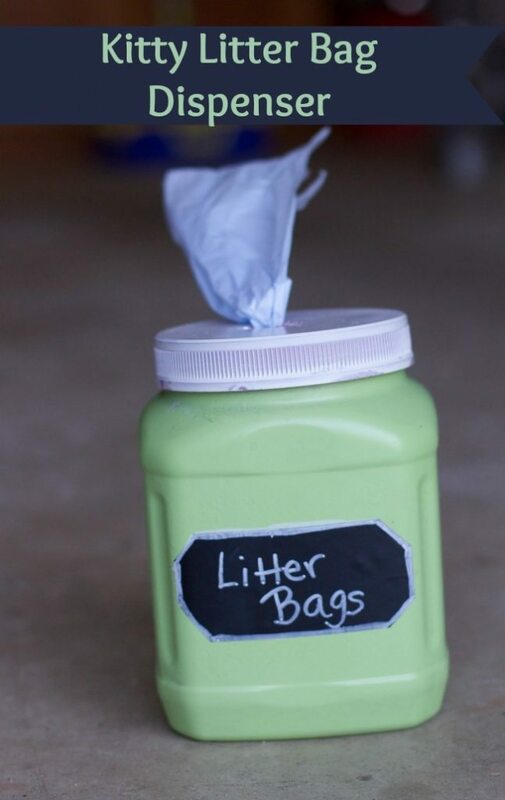 With some simple items you probably already have around the house, you too can create this easy litter-bag dispenser. We used a plastic container. 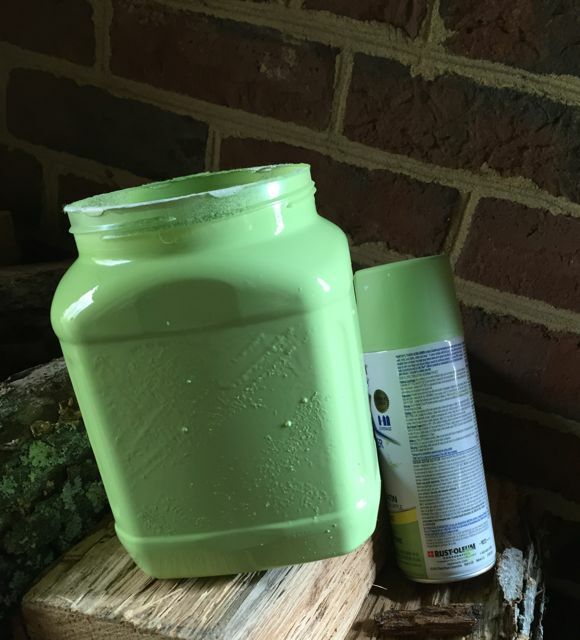 Spray paint the outside of the container, along with the lid if desired. 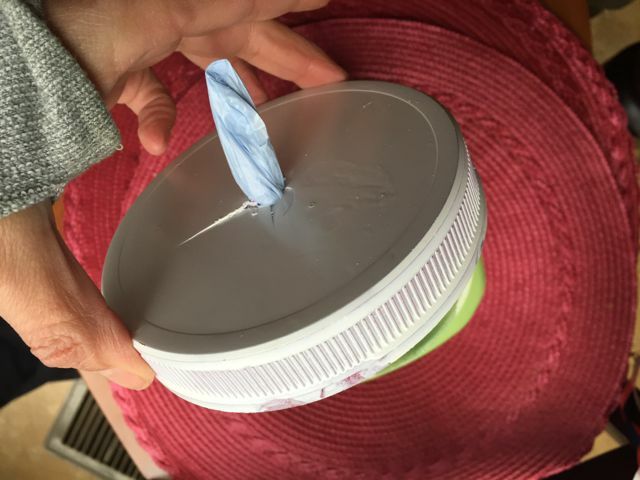 Carefully drill a hole into the lid or cut a large hole with a craft knife. 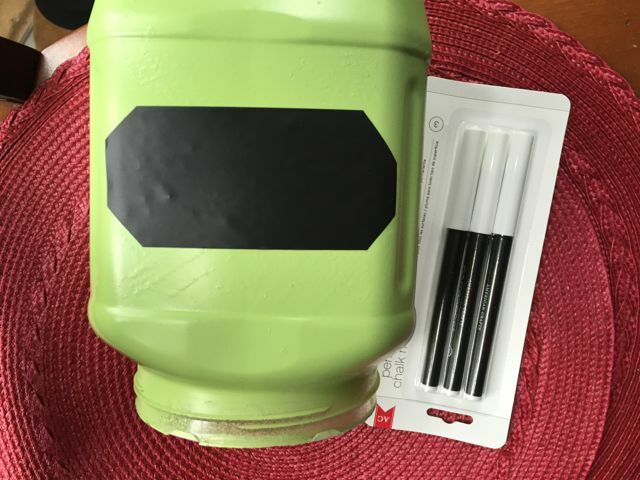 Using a chalkboard sticker or tape, create a label! 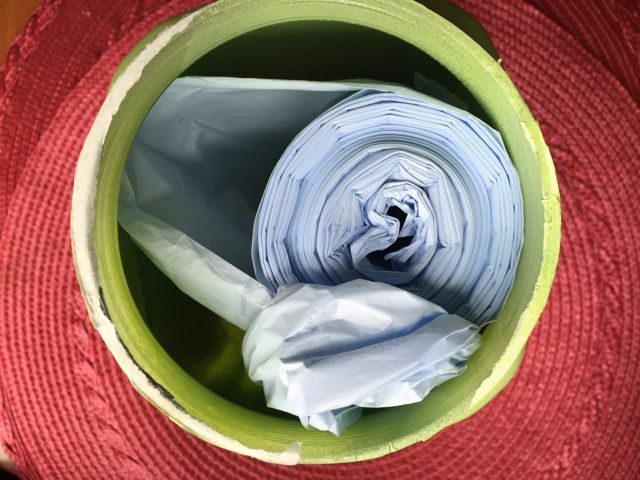 Pick up a roll of small garbage bags to put inside your plastic container. Pull the first garbage bag through the hole on the lid, and you have a bag dispenser for your litter box. Cute, functional and easy to make. 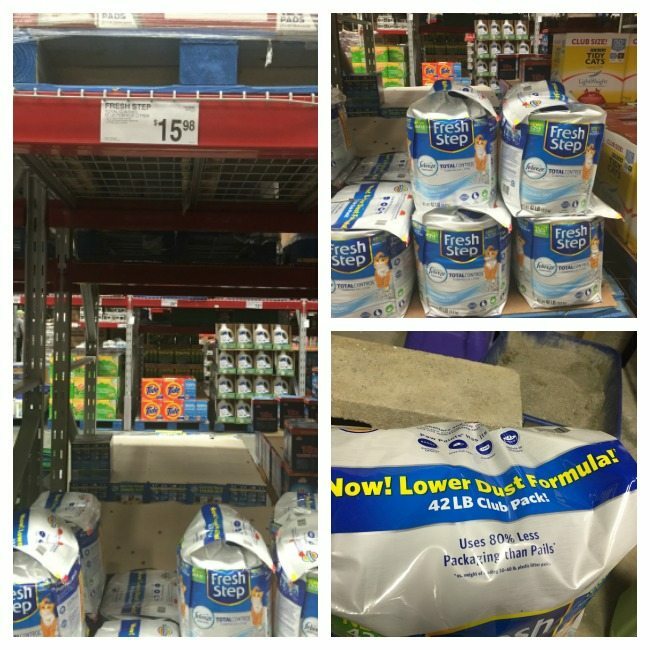 You can only find Fresh Step Total Control with Power of Febreze at Sam’s Club. What makes this litter so special? Not only is it a great clumping litter, but Fresh Step Total Control with Power of Febreze also contains borate technology to help control the ammonia and inhibit growth of odor-causing bacteria. It comes in a 42-pound bag, so you won’t run out quickly. It even includes a money-back guarantee. The smell of the lemongrass scented litter, really makes you forget there is an animal living in that space. Next time you come over you might find a bowl of the litter hidden near my children’s sport equipment. Thanks to the folks from Fresh Step we also donated $100 to the local shelter where we adopted our cat, Lacy. I had no idea that $100 would only cover rabies vaccinations for seven cats. This just reminds us that the organizations use all the donations possible. If you adopted your cat, consider giving back to the organization in which you adopted, the $50 fee you paid at adoption barely covers the costs. And remember, if you live with a smelly cat, consider switching to Fresh Step Total Control with the Power of Febreze, and both you and your cat will be happy! I can look into it. is there a unsubscribe button at the bottom of the emails? Thanks Amy, our litter box is in the garage, but any color to brighten things up in there. yes a great idea for any “poop” really. My husband felt the same way but somehow I readopted the task. A very ingenious idea indeed. 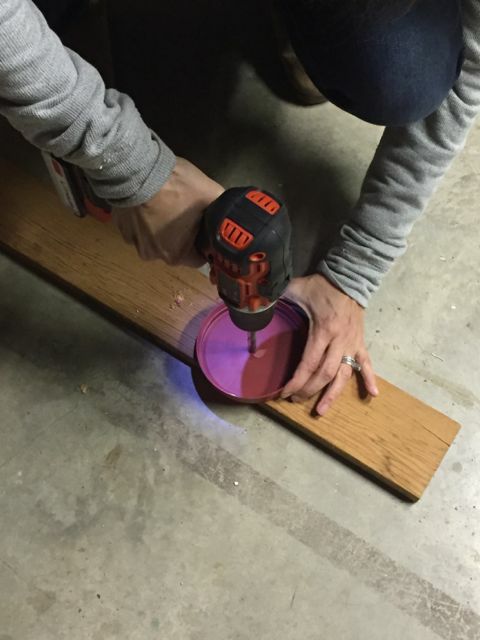 I can’t believe your kids would try to avoid this chore?! I’ve always hated cleaning litter boxes myself as that become my chore for my wife’s cat while she was pregnant with our twins. Somehow it became my permanent responsibility. I have a feeling one of these litter bag dispensers may be appearing for me. This is such a fabulous idea! Litter bags are always rolling away or being misplaced. This is perfect! We don’t have any cats but this would be perfect for our washroom! I change a lot of diapers and this would be perfect to help control odor for sure! Love this DIY dispenser. We’re big fans of Fresh Step litter in my house; it’s the best clumping litter I’ve tried. I haven’t heard of this particular one with Febreeze, but it sounds like it could be my new favorite! This is such a great idea to keep those bags out of sight! We have two cats and I think I am going to try to make one of these! This is a cute idea. 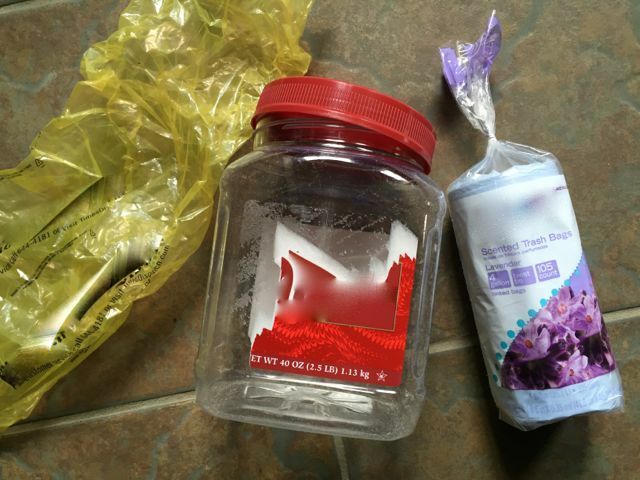 We don’t have any kitties here but I am sure the cute jar makes hiding plastic bags so much easier…and more fun. Ammonia smell is the worst. We don’t have cats, but this is a great idea! 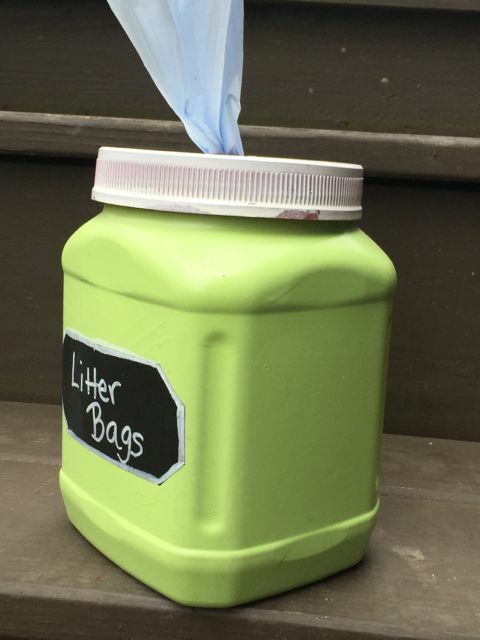 The container is a great way to purpose and to be crafty!